You cannot Passover this Post! Well it’s that time of year again. No, I’m not referring to NBA playoffs, although there are few things more exciting happening right now. I am talking about Passover. Passover is actually a pretty fun time in my house. My dad leads the Seder and I, as the lady of the house, do everything else. I spend days on my brisket. Now, everyone thinks his or her mom makes the best brisket, and who am I to argue. So, you won’t find my brisket recipe here, at least for now. 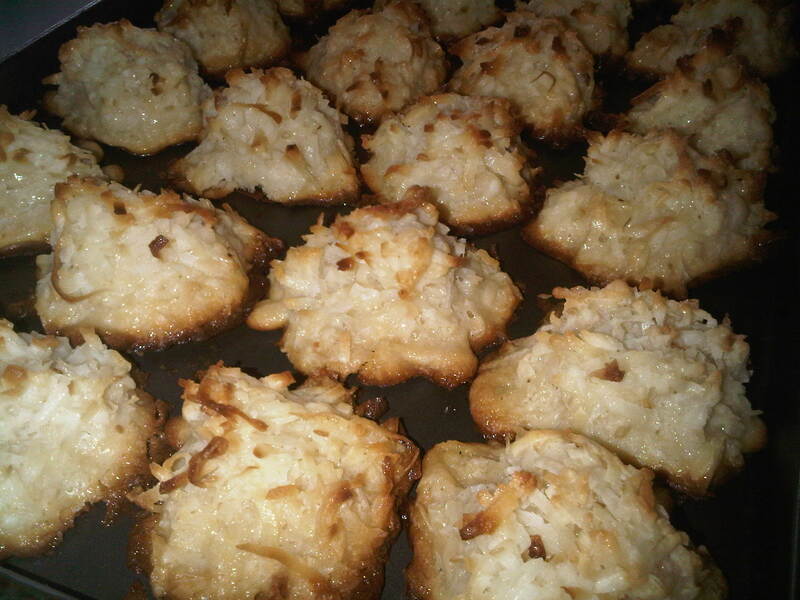 I’m going to share a recipe for another Passover classic, Coconut Macaroons! They are so easy you are never going to look at a can of Manischewitz macaroons the same again. Preheat the oven to 325 degrees F. Combine the coconut, condensed milk, and vanilla in a large bowl. Make sure the condensed milk covers all of the coconut. Whip the egg whites and salt on high speed in a separate bowl with an electric mixer until they make medium to firm peaks. To check your peaks, hold the whisk upside-down. You have medium to firm peaks when they hold and the ridges are more distinct, but the tips fold back on themselves. Carefully fold the egg whites into the coconut mixture. Drop the batter onto sheet pans using a tablespoon to measure each macaroon. You can use another spoon to help you remove the batter, or just use your hands. I prefer to use my hands; there is nothing like getting dirty in the kitchen! Bake for 25-30 minutes, or until golden brown. Resist the urge to grab one right as they come out of the oven. If you don’t let them cool, they will fall apart on the sheet pan. *To make “German Chocolate Cake” Macaroons, add ½ a cup of chopped walnuts and ¼ cup of sweet ground chocolate. I prefer Ghirardelli because it’s not overwhelmingly chocolate. It just gives you that perfect, subtle hint of goodness. **In a heatproof bowl set over a pot of barely simmering water, stir 2 tablespoons of butter and 4 ounces of semisweet chocolate until smooth. Hold the macaroon on one edge and dip other side into the chocolate to coat half the cookie. Shake off excess chocolate. Set the macaroon on a waxed paper-lined baking sheet. Place in the refrigerator for at least 30 minutes.